The Elite 5120 Single Arm Ceiling Mount pulls down when needed and pushes up and out of the way when not in use. Effortlessly raise and lower your monitor, and tilt, pan and rotate the screen for the best viewing angles and to avoid glare. This mounting arm lifts vertically, extends horizontally, lowers through a 90° range of motion, and rotates 360° at both the ceiling mount and at the end of the arm for complete control of viewing angle. 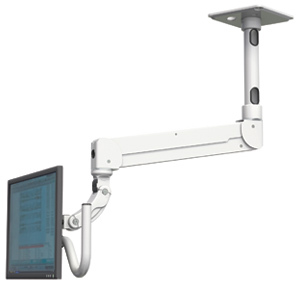 This versatile arm is ideal for monitor viewing in healthcare, dental, and manufacturing/industrial environments.